Prices of flat-panel LCD computer monitors continue to drop throughout 2012, and it's now feasible to purchase a reasonable 23in, full-HD screen for around £100. Spend more and better-quality panel technologies become available, 3D makes an appearance, while larger, higher-resolution screens dominate the premium end of the market. Philips, meanwhile, tempts potential customers to spend £125 on a 21.5in monitor. Though not appearing to offer excellent value-for-money at the outset, the 221S3UCB has a neat trick up its sleeve... it's powered solely by USB. Philips uses a low-power LED backlight on this model to reduce energy consumption to a maximum of 9W, compared with the 15-20W pulled by other monitors of this size. The obvious benefit in having a reduced-power screen rests with it being able to run from a single (dual-input) USB 2.0 cable. 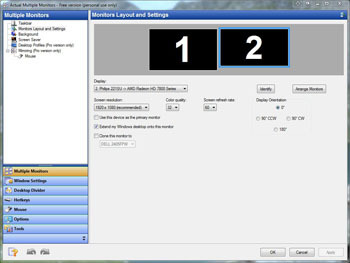 The simple design is helped by having no buttons on the monitor casing. The centre section, just below the Philips logo, lights up when there's power fed to the screen. Deserving a mention is the stand. All too often manufacturers supply the cheapest, most inflexible stand they can get away with. Philips' has a 70mm height adjustment and generous tilt and swivel, lending weight to its focus as a business-orientated screen. By its very nature, the 221S3UCB's minimalist design extends to the inputs. There's a single USB port - for power and video - along with an input for an optional power adapter (not bundled) should the USB power be insufficient. 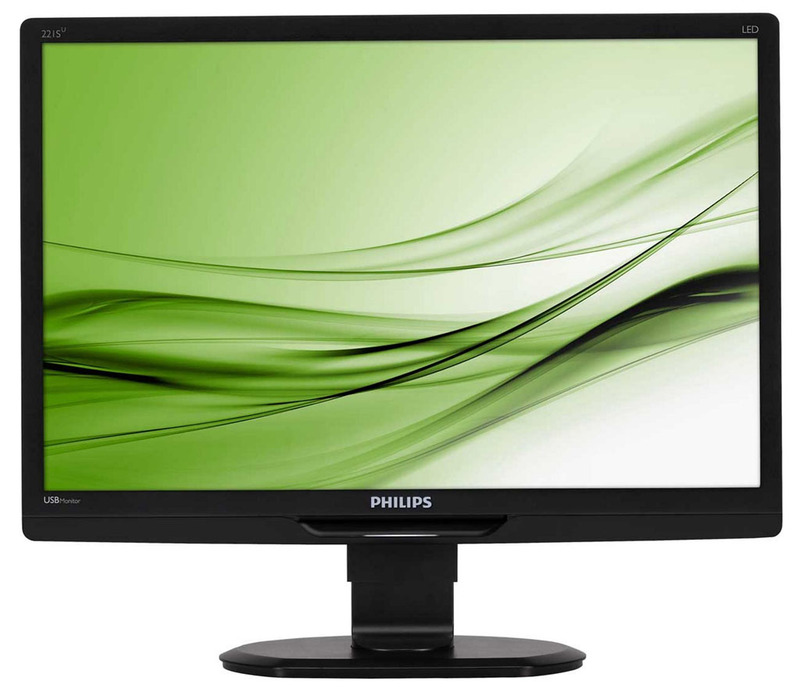 Philips envisions this 3.8kg monitor being used in situations where simplicity, rather than performance, is key. It can be attached to any computer toting USB ports and removing the power and signal cables heralds the possibility of a relatively clutter-free desktop. Philips uses an energy-efficient TN panel that produces reasonable image quality when viewed from head-on. Move much in either direction and the screen, while eminently readable, appears rather dark. We'd liken its IQ to a budget panel - one that would cost comfortably less if it wasn't imbued with DisplayLink magic. Perhaps more troubling for Philips is the £125 asking price is consistent with what is being charged for standard IPS panels that have fundamentally better colour accuracy, viewing angles and gaming credentials. Being fair to Philips, there's an inevitable trade-off between panel quality, energy efficiency, price and performance - there is no mature technology that can fulfill all these criteria. With the screen treated as a regular USB device, you may be wondering just how it's able to display images produced by the graphics in the host PC. This is where the folks at DisplayLink come in. The firm's software is bundled on a driver CD and must be installed on the computer. This software analyses the required video output and uses the PC's CPU and GPU to compress the data and send it over the USB 2.0 cable. Adaptive compression is absolutely necessary as USB 2.0 does not sport enough bandwidth for full-HD movie streaming. A DisplayLink chip embedded into the USB monitor then decompresses the data and pushes it onto the screen, meaning the USB wire carries both power and video. DisplayLink's technology is flexible enough to allow the monitor to be used as a primary or secondary display and it has teamed up with Actual Multiple Monitors to offer a trial version of its multi-monitor software. Installation, as expected, is a cinch. A lack of monitor-side controls means that any image adjustment needs to be undertaken through software, which takes a little getting used to. Connected to an Intel Core i7-powered PC and run as a second, desktop-extending screen and as a main monitor, the Philips USB monitor works well enough for everyday tasks such as emailing and web browsing, though there remains a nagging feeling that it's not connected via the usual DVI or HDMI pathways; super-fast mouse movements, which feel a split-second behind, betray the fact that the signal is fed via USB. The real test of DisplayLink's mettle is revealed when playing games and/or watching high-definition movies, as both require significant compression/decompression over the USB conduit. Watching a 720p, h.264-encoded movie, for example, leads to a reasonable viewing experience. Increase the load to a 1080p clip, however, and frames are dropped every once in a while, which becomes immediately noticeable. The same story is true of full-HD gaming - we ran Max Payne 3 and felt the USB-connected display produce 'laggy' feedback - a combination of the quality of the panel itself and the need to transmit data over USB - which was not apparent on a DVI-equipped Dell 2405FPW monitor. A single-wire, bus-powered connection perhaps better lends itself to being used alongside a laptop computer, where adding a larger display - or, indeed, enabling multiple displays - can be a chore. The 221S3UCB's simplicity is also its Achilles Heel; the display places a cumulative stress on a battery-powered laptop of increased power-draw and the extra computational power required for video-signal compression. Running a 720p clip on an Intel Core i3 laptop pushes CPU utilisation up to around 25-30 per cent while a 1080p clip requires a total resource of around 50 per cent. Putting some numbers for context by running a mix of regular applications and videos, we found that the laptop's usual four-hour battery life drained in about half the time when connected to the USB monitor.